Researchers at the University of Notre Dame recently announced the development of a new paint that generates electricity using semi-conducting particles. The paint, dubbed "Sun-Believable," would be cheap enough to cover an entire house and could produce enough energy to power home appliances. The research team says the paint was the result of an effort to move beyond silicon-based solar technology. By mixing power-producing nanoparticles, called quantum dots, into a spreadable compound, the scientists created a one-coat solar paint that can be applied to any surface. Currently, the light-to-energy conversion rate of the paint sits at 1 percent. But the research team says further research will make increased efficiency possible. 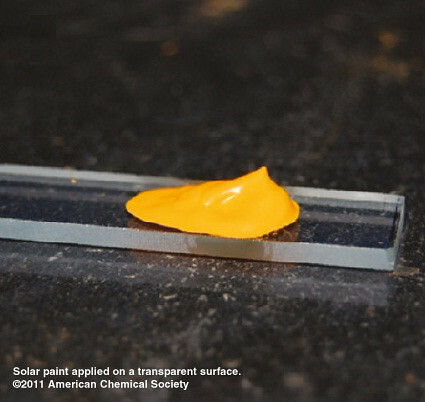 With the ability to make the paint cheaply, and in large quantities, researchers believe Sun-Believable paint will make a tremendous difference in meeting future energy needs. The paint could play an important part in the construction of affordable zero-energy homes and buildings, complementing a combination of other green technologies such as solar water heating and energy-efficient design.